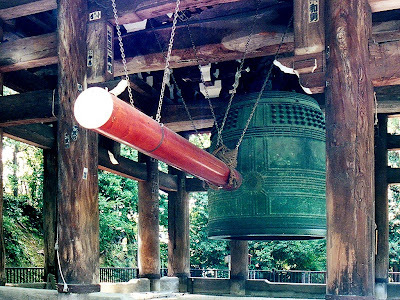 The BBC World Service’s Heart and Soul program of 3, 3, 2010 is about Japanese Buddhist temple bells. You can read a transcript of the program, look at the pictures of the bells or listen to the program (it’s best because you hear the chiming) at http://www.bbc.co.uk/programmes/p006dg47 It’s really worth looking or listening too. Thanks for that one Bhante. I have long been interested in these bonshu and their sublime sounds. I remember first being impressed by one particular temple bell that was sounded during the Sutra chanting sessions of a documentary about The Ehiji Zen temple. I still have a very scratchy old copy of the documentary on vhs video that I watch from time to time. Interesting Haiku about the butterfly landing on the bonshu as well, all very Zen indeed! When I lived in Tokyo, nothing was quite as hauntingly, mysteriously beautiful as the tolling of the bells 108 times on New Year's Eve. My boyfriend and I would go every year to a different temple in the neighborhood to meditate through the evening (if we weren't on a NYE pilgrimage to 7 shrines for the 7 Shinto gods of good luck). From the crowds at Zojoji to the tiny temple down the alley from my home, we could always be sure of the magic of these bells. And I particularly love the story of Dojoji Musume - the story of a monk who resists the seductive charms of a young widow who then transforms into a giant serpent. She chases him back to the temple, where he hides under the great bell. The serpent wraps herself around the bells and tries to crack it, only succeeding in beating herself to death in desire. The monk underneath the bell was reduced to ashes. --And while I usually tell traditional tales as they have been handed down, I've updated this story as part of my storytelling performance repertory. So thank you for the link to the program. I'm looking forward to watching it tonight when I get home. When I saw this picture the sound of the bell echoed inside my body. New years eve, we walk to near by temple and each of us would hit one of the 108 bells. We must use whole body to hit the bell and every sound comes out different depend on who hits it. Thank you Bhante for this reminder.